Way back in the day they used to do space missions. I was born in 69 a month after the whole moon dealio happened. I been a fan my whole life. I made it a point to know not only who the first man on the moon was but also the last (look it up) that was until my friend Jimbo enlightened me to the fact the the last man on the moon probably hasn't been born yet. Well played Jimbo. This rad pic is unique because it's the ultimate anti-photobomb. This was taken by Micheal Collins during an Apollo mission. 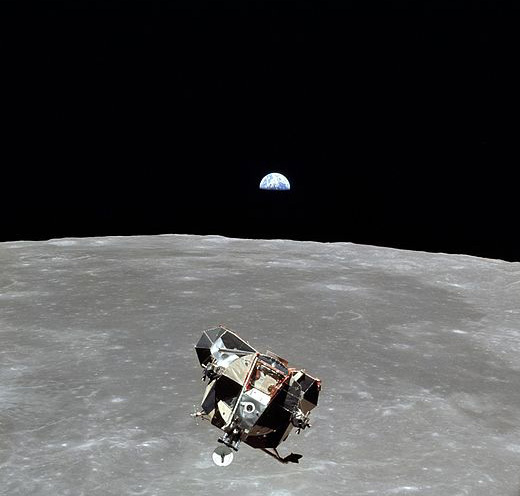 He managed to take a shot of both his buddies AND everyone who has ever lived. He is the only member of humanity that it theoretically not in the picture. Anti-photobomb ace! Rock on Donkey Kong! I came up with the art for this puzzle. It's a rubber chicken... initializing the big bang. I can't tell if the intricate design makes the puzzle more or less challenging. web page at the link below. Three spaghetti specials and a side of rocknroll. The Spaghetti song. I just got a large coffee. When asked if i wanted room for cream I said "Yes, two fingers is fine please." What I got was a small coffee in a large cup. I should have clarified (in my american colloquialism) that I intended the attitude of the fingers to be horizontal not down the cup. I decided that the cream was actually more valuable than the coffee so I topped it off, took it home and ate coffee flavored corn flakes instead of drinking it. That's how us hustlers roll. After our gig at the fair we were hired to do a huge party (for a three year old) by some folks from Vietnam. It went over great. Lots of nice people, the kids were charming, generous tip and they fed us so much, we took home huge plates of food. A lady said "Hope you don't mind so many Asians" Olive and I just looked at each other and smiled. We love everybody. And talk about fantastic hosts, after awhile Grampa broke out the karaoke machine and started singing for us. He wasn't bad at all. Grampa has great pipes. I don't know what he was singing but his voice was on key and pleasant. I easily knew what chords and notes the songs were. I had my guitar and almost joined him. He wasn't doing ethnic religious music, it was basically 70's contemporary light rock with lyrics in his language. I thought "OK this song is kind of like a less depressing "seasons in the sun" mixed with someone playing a saw, I can do a bass line to this...but what would grampa think? He just met me. I only seen him knock down two cold ones and so far he has been the only one rocking the mic. Is there a reason his elder gentlemen buddies aren't singing songs too? Or did he escape North Vietnam just to be upstaged by a Texican clown?" By the time I was done trying to get into his head it was time for us to split. So in closing, music is an international language and thank you immigrant family for participating so robustly in the economy. We don't take the clown stuff off between gigs. So as I was trekking across our neighborhood to the burrito stand; a western dressed man happened to be walking ahead of me. A tall cowboy it seemed. It was just a coincidence that I was following the same path he was. To me...it was just two shlubs, shlubbing our way through our shlub-uary day, no big deal. But to him...he was being followed by a clown. He kept looking back until I tracked his 3rd turn or so. As we rounded the corner together he bolted into traffic like a loony attack scarecrow. Three cars stopped and I saw him yelling unkind things at me over the sound of the cars honking. He stormed away swearing. Good on him if that Palooka had a gun and didn't use it. Sorry fella, just need mah carne asado Yo. People have been asking me a lot, "Does the clown scare have a negative effect on your clown business?" Short answer: No. I'm not a creepy clown so I'm not competing with them. I'm a whole 'nuther thing and we are at the top of our game and we strive to keep making friends. The scary thing about a lot of clowns is the mask. We don't wear masks, just enough clownface for folks to know we are on duty. Portland is a place where a clown can be for kids and adults without freaking anyone out. A clown can sing loony tunes for kids in the morning and then be half naked doing burlesque for the parents that night. How do I know? I been doing it in Puddletown for 19 years. I started off kind of menacing but that's understandable. My first clown show in the Pacific Northwest was for tree-sitters and riot cops at a protest in 1990's Eugene Oregon. I used to come home covered in pepper-spray and pocket-fulls of rubber bullets. Nowadays I'm a lot more "approachable." These days we only get a couple people per year running away afraid but thousands of people a year coming to our shows. I am afraid of some clowns. The creepiest clowns to me are crappy clowns. People who think they can put on clown drag and suddenly be a clown. I'm afraid of them like a fisherman is afraid of a trumpet player. Sometimes they show up raggedy looking, stinky, makeup scrawled on like a child did it or showing up in "clown" from the waist up but sweats, no underwear and sneakers below. YUK! Sometimes we hire a clown who shows up drunk that's always terrifying, the bigger the gig the more terrifying it is. How about one with an anger problem, no clue what to do or one who doesn't like money or crowds. Ever seen a stage frightened clown? I have. I sang a little song as that ship sank. Those realities are what my nightmares are made of. I see why folks want to be on board. Being a modern clown comes with some amazing perks. Free food, lots of romance/indecent proposals, money, adoration, gifts,random old people hugs, free bus rides, hand-me-down clothing from drag queens and kids actually run to you in dangerous situations instead of running away on sight. Truth is, it's easy to be a clown nobody likes but very hard to be likable enough to make a living year round. A good Portland clown actually gets tipped by a stripper (for a balloon flower) instead of the other way around. People love to buy the clown a beer. That was a problem for many years as I worked in many nightclubs doing circus sideshow. I got to enjoy a long drinking problem and fantastic downward spiral. I actually used to be the kind of clown I'm afraid to work with. I've been sober a long tome now and have been getting nothing but net in the clown field ever since. If anything, creepy clown movies give folks an opportunity to mention how not creepy we are. They are helping us. Lots of folks talk about clown fear but you rarely (if ever) hear about people who are turned on by clowns... unless you are a clown lol. I easily see a lot more people delighted to see us than repulsed (nannr nannr boo boo). So while I am actually afraid of poser clowns I have seen no effect in our business from scary clown movies or kids in fields wearing masks. I hear breathing, it's my son, I smile. "Dad, check it out, touch this." I get shocked awake. "That's 2 volts. Now try this." again I'm not awake enough not to do as he said. ZAAP "That's 4 volts. It's a pen that shocks. Can't have it at school because it's weaponry so you can play with it here Dad." Then he runs off leaving me with his weaponized writing implement. Olive and Dingo adventures "Ashes from the forest fire edition"
I just overheard our little boy and his buddy talking about the man who killed himself by running into the fire at Burning man. That gave me a nice teachable moment. Pondering why, was cool but none of my beeswax. If that is how the man wanted to go then good for him, beats expiring someplace dreadful under unpleasant situations. I would be joining him if "going back home" meant going anywhere in the state of Oklahoma (sorry OK.). Still kind of a dic move though to the other fest goers. Bigtime party foul. Mostly I wanted the boys to understand and fully appreciate the fire crew. They weren't intending to run into the fire but didn't hesitate to do what they train for. I hope they made it out alright, I didn't see much about them in the report I read. This has always been my foundation idea of anti fascism. Keeping "the man" out of "the people's" business. Fascists like the companies lightly regulated and the people highly regulated. I have always been committed to exposing the fake reasons they give for the imposed superiority. Race, religion and class are primitive reasons to subjugate the people. A lot of time and money is spent developing the groupthink that keep people from knowing the difference between a prospector and an elder. I hope to find much funnier ways to satirize and comment. This movie is a huge inspiration. Yesterday someone told me "Y'know we really die twice, once when we die and then again the last time someone thinks of us. It may take awhile but statistically it will happen." :) And I said... "That's all well and good. I agree that we are no more remarkable than leaves in a tree. I'm actually very good with that...BUT what I asked was, what color balloon kitty do you want. Red or Blue Mr. Magoo? You decided to go all existential off the 9 lives myth and down the human mortality rabbit hole. I'm just a town clown with a growing landlord to feed. :) Some 8 years olds Right?